The Bible teaches that when you are married, you are become one flesh. "Therefore shall a man leave his father and his mother, and shall cleave unto his wife: and they shall be one flesh" (Genesis 2:24). 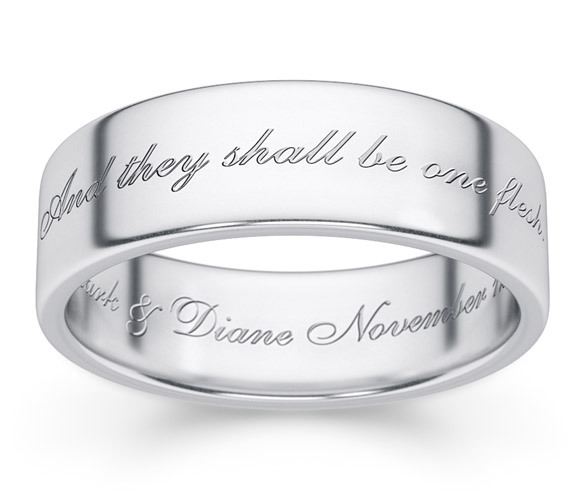 The words, "And they shall be one flesh" is engraved on the front of a 14k white gold wedding band ring, with your names and wedding date (or inscription of your choice) engraved on the inside of the band. The ring is available in 6mm - 8mm width (shown here in 6mm). Also available in 18k or yellow gold (shown below). We guarantee our One Flesh Wedding Band Ring in 14K White Gold to be high quality, authentic jewelry, as described above.